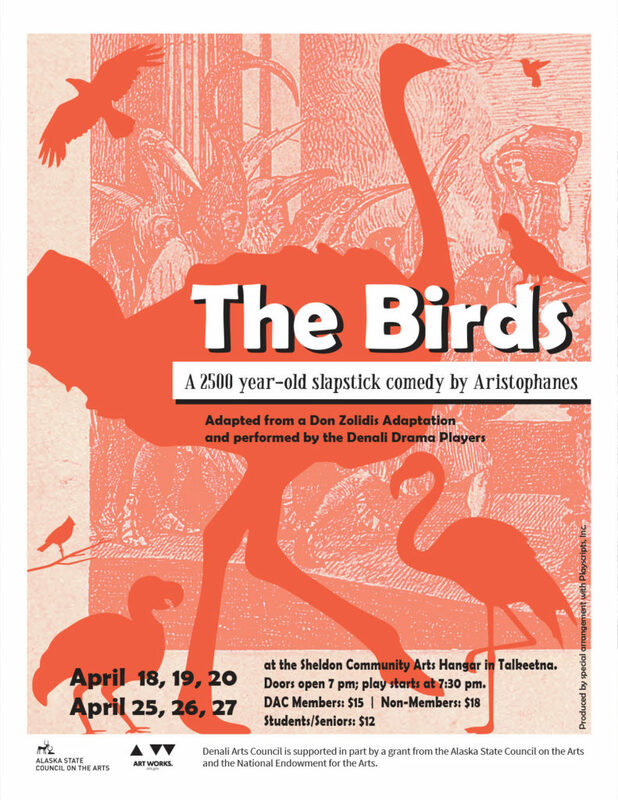 Just in time for spring migration, Denali Drama will present Aristophanes’ 2500 year-old slap-stick comedy, The Birds April 18, 19, 20 and 25, 26, 27. The story centers around two humans fed up with life in Athens who climb into the realm of the birds seeking a better life. They convince the king of birds to build a wall to keep out mortals from below and prevent the gods from getting sacrificial smoke from their followers on Earth. Naturally, chaos, confusion, and hilarity ensues. Bridled titmouse, blue-footed boobie, an ostrich, and a hoopoe! Among Aristophanes’ other comedies are Lysistrata, The Clouds, and The Frogs.